A big challenge for the developers of this franchise was expanding into the handheld market. How could one possibly hook up a guitar-like design on a small device? Guitar Hero: On Tour provides the answer to that call. The game comes with a set of keys that lock into the slot reserved for Game Boy Advanced titles. It even comes with an attachment that allows owners of the original Nintendo DS to hook up the keys. The main game mode is straightforward: start a band and work your way through the ranks into stardom by completing certain songs. After you complete 5 songs in a venue, you’re allows to advance to the next one. There are also many unlockables throughout the game that can only be achieved by playing through the main storyline. The better you perform the songs, the more you can unlock, which include the likes of new guitars, new clothes and the like. There are also different game modes to play through. You can dual with another guitarist (the A.I. ), gain powerups (such as cutting guitar strings, forcing the player to sign an obscure object, setting the guitar on fire, and more) and earn more unlockables. There’s even a multiplayer option allowing you to either dual a fellow DS gamer, or play a duet with him or her. Unfortunately, there is no online play, which is a shame. This game would be a lot of fun to play over the internet. The way to interact with the game is by using the touch screen to strum the guitar with a guitar pick that comes with the game. While strumming, you’ll use the keys on the side to help you play different notes. There is a slight learning curve, but overall it works fairly well. You can adjust the settings accordingly if you’re right-handed or left-handed. Unfortunately, one big setback with the keys is that they are merged fairly close together, which are not particularly friendly for gamers with big hands. The strap that comes with the keys is useful for making sure that the DS doesn’t fall out of your hands. However, I found that having put my hand in the strap that it would get far more cramped than without it. The incredible sensitivity of the touch screen is also a bit of an issue. Simply by touching the screen, the game will count it as a “strum” initially making you hit a note that you weren’t supposed to, causing you to break a consecutive note-streak or any other build-up that allows you to increase your score throughout a song. Naturally, the response to that is not to actually have the pick near the screen if you don’t have to play. 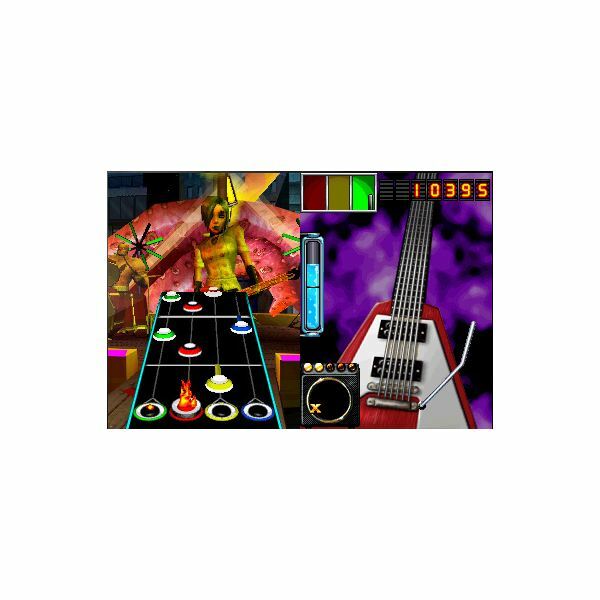 Perhaps an option to increase or decrease the sensitivity of the touch pad would be ideal should a future Guitar Hero release be made available for the DS. While dazzling graphics don’t have to be the center of attention in a game like this, fluid animation is definitely a must. Fortunately the animations of the notes that scroll on the screen are incredibly smooth. The character designs and environment designs of the different venues are about on par with what the DS is capable of, but this isn’t a game of eye-candy. A lot of people might think that with a DS cartridge’s storage capacity, it would seem highly unlikely for the songs to come through in a satisfactory quality. Fortunately, the sound quality of the music in the game is actually really good. While the speakers on the DS won’t allow you to stick your unit out the window and rock out for the entire world to hear, it’s still pretty good. The recommendation while the game is loading even suggests using headphones if the music is difficult to hear. 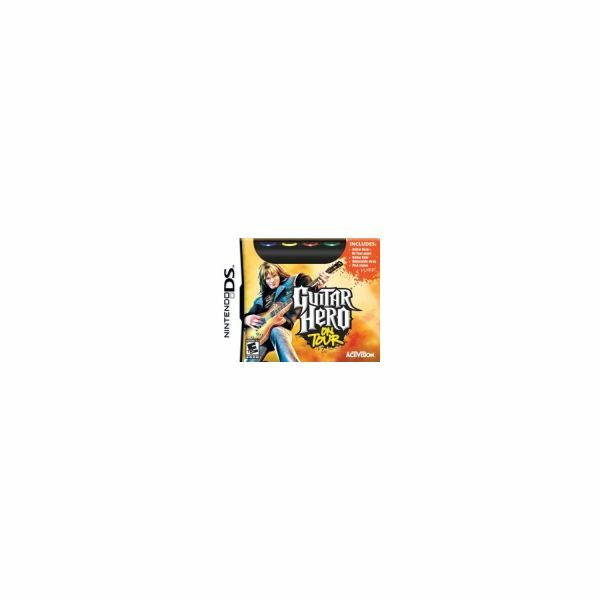 With four different difficulty levels, different game modes and many things to unlock, Guitar Hero: On Tour will be very active on your DS for a long, long while. The music selection is very good, and the guitar duals and duets are immensely fun. 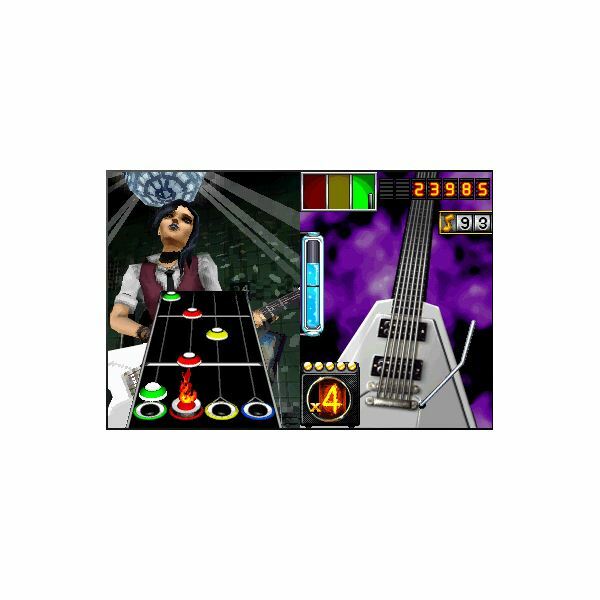 While the keys can be a bit of an issue for older gamers, or gamers with big hands, Guitar Hero: On Tour is one of the best games you can have on your DS. Fans of the series really need to get their hands on a copy as soon as they can. Those who are new to the franchise really ought to get a copy as well. While it won’t help you be any better at the guitar, or any other musical instrument, it is definitely a game worth having in your collection. Highly recommended.